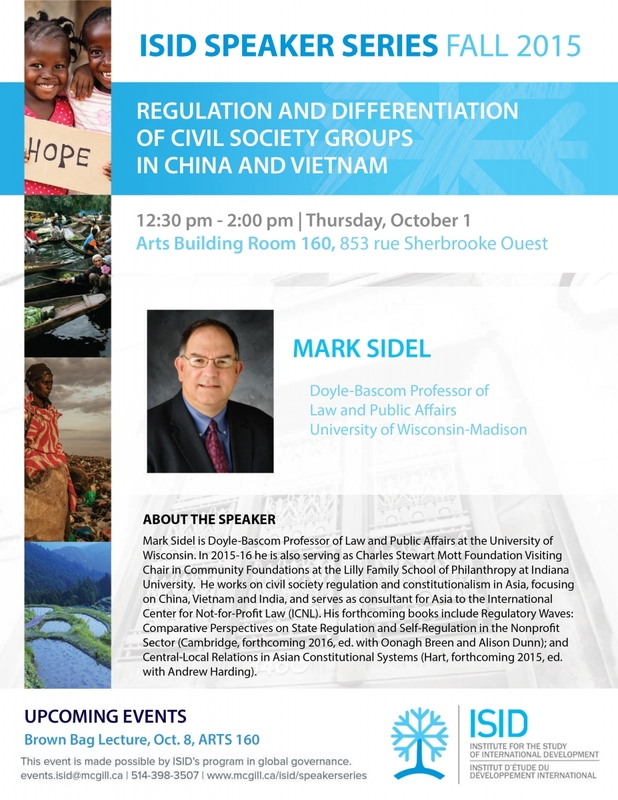 Speaker: Mark Sidel is Doyle-Bascom Professor of Law and Public Affairs at the University of Wisconsin. In 2015-16 he is also serving as Charles Stewart Mott Foundation Visiting Chair in Community Foundations at the Lilly Family School of Philanthropy at Indiana University. He works on civil society regulation and constitutionalism in Asia, focusing on China, Vietnam and India, and serves as consultant for Asia to the International Center for Not-for-Profit Law (ICNL). His forthcoming books include Regulatory Waves: Comparative Perspectives on State Regulation and Self-Regulation in the Nonprofit Sector (Cambridge, forthcoming 2016, ed. with Oonagh Breen and Alison Dunn); and Central-Local Relations in Asian Constitutional Systems (Hart, forthcoming 2015, ed. with Andrew Harding).